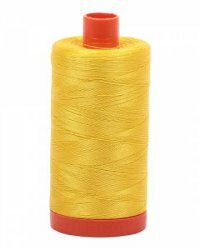 Aurifil 50wt Cotton Thread is a 2-ply Mako Cotton Thread. A higher thread weight indicates a finer (thinner) thread. Finer thread will emphasize your fabric choices and quilt design.